Address: 809 B St, 1212 2nd St., 1214 2nd St. The project proposes to construct a four-story, mixed-use building with 41 ‘rental’ residential units or apartments above 1,939 sq. ft. of commercial retail space located on four adjacent Downtown lots (northwest corner of B and Second Streets) with a combined area of 23,800 sq. ft.(approx.). The project also proposes 48, garage parking spaces, located behind the commercial retail space, including 10 tandem parking spaces. 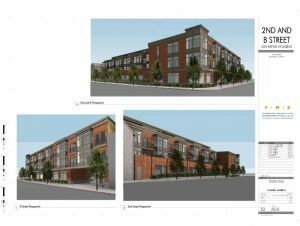 The proposed configuration of residences includes 4 studio units (517-803 sq ft in size, 26 one-bedroom/one-bathroom units, 847-892 sq ft in size and 11, two-bedroom/two-bathroom units, 973 – 1,263 sq. ft. in size. The project includes a 35% density bonus request. Both vehicular and pedestrian access to the project is proposed along the B St elevation. A secondary means of egress/ingress for residents would be located along the Second St elevation. The project proposes to demolish all three existing structures on site, including a single-story, 4,500 sq. ft., commercial building located at the corner of B and Second St and two, two-story, Victorian-era residences along Second St, one of which is a local cultural resource. The project was reviewed by the Design Review Board (DRB) on Tuesday, August 20, 2013 at 7pm for review and recommendations on the design of the project, including design-related topics such as site planning, architecture, bulk, mass, colors, materials, site improvements and landscaping. The item was continued with certain design recommendation. Revised plans were then resubmitted to address DRB comments and the project was reviewed by the DRB again on Tuesday July 8, 2014 and continued for additional design comments. Plans were again revised and the revisions were reviewed by the DRB on August 5, 2014 and recommended for approval with certain minor changes and follow-up review of final landscaping and outdoor amenities. The staff report and video proceeds of these meetings can be viewed at www.cityofsanrafael.org/meetings and then clicking on the agenda for the DRB date you are interested in viewing. An Initial Study was completed and determined that an EIR must be prepared. A Notice of (NOP) Preparation was issued on Monday, June 24th for the preparation of the EIR and allowed for a 30 day comment period for scoping of the issues to be included in the EIR, ending on Tuesday, June 23, 2013. The Planning Commission held a public hearing on the EIR scoping on Tuesday, July 23, 2013 at 7pm. and provided direction on the scope and preparation of the Draft EIR. The Draft EIR (DEIR) for this project has been prepared and was released for public review on Friday, 9/18/15, for a 45-day public review period ending on Tuesday, November 10, 2015 at 7pm. The Planning Commission held a public hearing on the Draft EIR on Tuesday, 11/10 at 7pm. Public comments on the DEIR were accepted in writing within the 45 days or verbally, at the Planning Commission hearing. A Final EIR (FEIR) was prepared and released for public review on 4/25/2016. The FEIR is the Draft EIR with the responses to comments. The Planning Commission reviewed the Final EIR, along with the planning applications, at a public hearing on Tuesday, May 10, 2016 at 7pm. Following deliberation on the FEIR and project merits, the Commission approved the project, adopting three Resolutions. On April 25th, 2018, a two year time extension was granted and the planning entitlements for the project are now valid until May 10, 2020.